The Secret Power Of The End. 1. Where You Are, Is Not Who You Are. 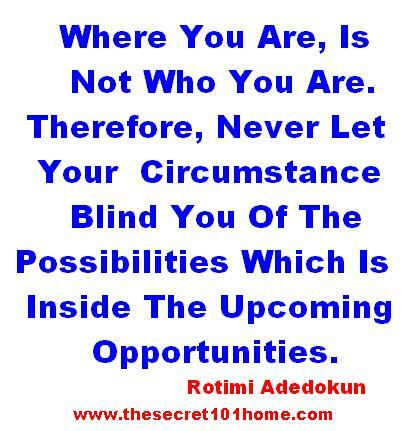 Never Let Your Circumstance Blind You Of The Possibilities Which Is Inside The Upcoming Opportunities. 2. Here Is Never The Same As There. The Different Is Time. If You Can Come This Far You Can Go That Far. Where You Are Is The Evidence Of Where You Are Going. Don’t Wait For Result Create Results. 3. Never Confuses Failure In Event With Failure In Person. If A Project That You Embark On Fails, That Does Not Connote You Fail. It Is The Project That Fail. All You Need To Do Is Learn And Try Again. But Your Refusal To Try Again Is What We Define As Failure In Person. 4. Every Great Thing Is Determine At The End. So Life Will Not Give You What You Want But Life Don’t Have Option Than To Give You What You Deserve. Become The Need Of Life And You Will Provoke Life To Give You What You Want. 5. A First Class Student Doesn’t Mean A First Class In Life. Most Of The Time C Student End Up Employing A First Class Student. The Secret Is Simple Is Not Who You Are Now Is What You Want To Do That Will Determine Your End. So Your Level Of Hardwork, Determination And Faith In Your Daily Input Is The Key. 6. Faith In Self Is The Mother Of Miracle. If You Can Develop Faith You Will Move Mountain Of Your Life. Before Possibilities You Have To Stop Impossibilities. The Reason Is Simple, You Need Experience To Grow And You Need Stories To Tell When You Arrive. No Story No Glory. 7. Greatness Is Available But Not Accessible By All. Results Is Possible But Difficult To Experience By Some. If You Don’t Imagine And Work Towards Your End, You Can Never Attract And Feature In Your Future. 8. One Thing That Matter Is The End. You Need To Work It. One Thing That Make The Different Is The End You Need To Believe In It. One Thing That Distinguish Is The End You Need To Wait For It. The End Is The Determinant Of You Life. 9. Remember At The End Everything Shall Speak. Your Investment On Your Wife And Children Shall Speak At The End. Your Investment In Your Personal Development Will Speak At The End. But If It Is Not The End It Will Not Speak. Greatness Only Speak At The End. 10. The Secret About The End Is That Is Not Far. The Day You Begin To Work Is The Day The End Begin To Move Towards You. Therefore Work Attract The End And End Is Captivate By Work. However, The Farther You Are To Your Work, The Farther Your End Will Be. It Is Not A Magic But A Law Of Life That Cannot Be Broken. 11. Remember What The Wise Man Said “There Is A Here After And The Expectation Of The Righteous Shall Not Be Cut Off. Therefore, Work Your Work And Allow God To Work His Work. Then You Shall Live In Your Expected End. 12. Where We Are Today Is The End That We Can See In July 2012. So If You Want Us To Achieve Another End Just Click Share At The Bottom. We Have Reached Over 15,000 Viewers In Less Than 3 Years. We Believe With Your Partnership We Can Reach Another 15,000 Before The End Of This Year. Follow @adedokunr, Like Our Facebook Page And Invite Friends And Family To http://www.thesecret101home.com It’s A Win-Win Deal. This entry was posted in Creation and Wisdom, Life and Time Management, Self Development, The Secret, Vitamin Of The Mind and tagged Bishop David Oyedepo On The End, Jim Rohn On The Arrival, Pastor E A Adeboye On The End], Proverbs 23:18, Rotimi Adedokun On The End, Than The Beginning Therefore, The End Of The Matter. Bookmark the permalink.